Don’t be caught unprepared in the great outdoors. Unforeseen emergencies are not uncommon when biking, hiking, boating or camping. 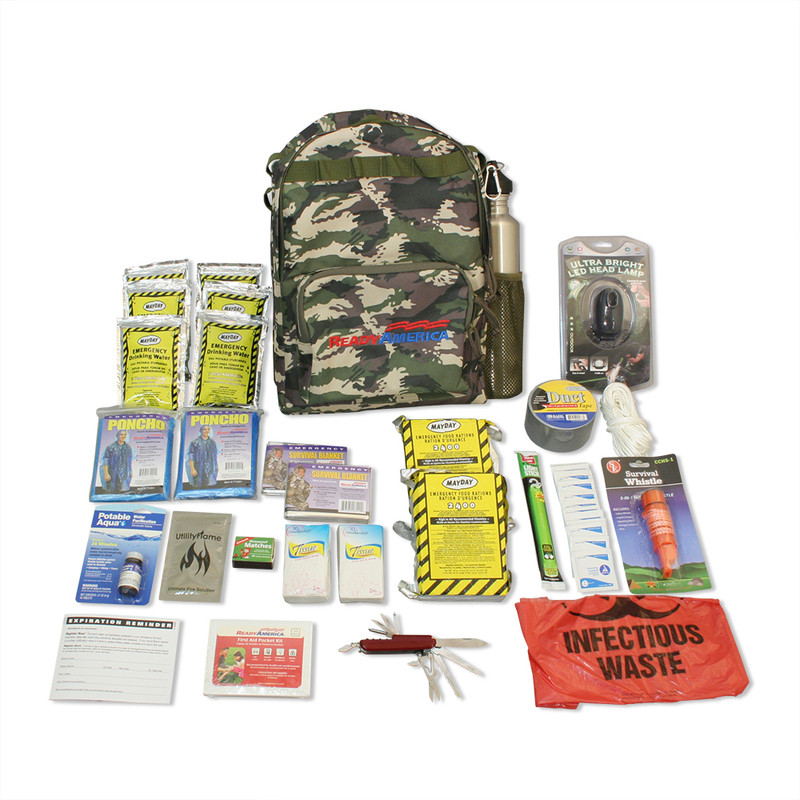 This backpack is stocked with a carefully-chosen collection of essential supplies to sustain two for at least the first 72 critical hours of an emergency situation. Food and water are the most important elements for survival. This kit not only contains food bars and water pouches, but also purification tablets for purifying another 24 quarts of water, and a stainless steel bottle, & fire fuel to enable you to boil and purify even more water. An LED crank-powered headlamp, a first-aid kit, a multi-function pocket knife, and lightsticks give you more protection and survival capability. Keep one kit in your home and one in your car, your cabin, boat, or your RV. *First-Aid Kit contains: (1) Plastic case;(1) First-Aid Guide; (6) 3/4” x 3” Adhesive Bandages; (10) 3/8” x 1-1/2” Junior Bandages; (1) 1-1/2” x 1’1/2” Patch Bandage; (1) Large Butterfly Wound Closure; (4) Alcohol Cleansing Wipes; (2) Antiseptic Cleansing Wipes; (1) Antiobiotic Ointment Pack; (2) Ibuprofen Tablets; (2) Extra-Strength Non- Aspirin Tablets; (2) Aspirin Tablets Actual contents may vary.